Thinking about selling your medical device or IVD in Australia or New Zealand? If your device already has CE Marking, you are well on your way to TGA compliance. However, the medical device regulatory system in Australia and New Zealand is not identical to the European system and there are important things you need to know. 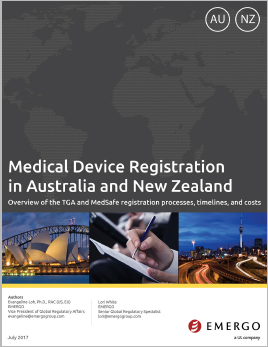 What is the regulatory process for medical devices in Australia and New Zealand? How are medical devices and IVDs classified in Australia? How can we leverage our CE Marking certificate? How do conformity assessment routes compare to those in Europe? What is the role of the Australian Sponsor? We'll answer all these questions and much more in this white paper. Evangeline Loh, Ph.D., is Vice President of Global Regulatory Affairs at Emergo Group.